Northern Bear Building Services has secured contracts worth over £4.5m in the first quarter of 2019. The work includes contracts for Northumberland County Council and Newcastle Hospitals NHS Foundation Trust and a new development on Aycliffe Business Park in County Durham. Northern Bear Building Services will be refurbishing County Hall in Morpeth, the headquarters of Northumberland County Council which was built nearly 40 years ago. The contract includes mechanical and electrical works, partitions, ceilings and a full internal fit out in a phased sequence to avoid compromising the day-to-day operation of the local authority. Newcastle Hospitals NHS Foundation Trust has awarded Northern Bear Building Services two new projects. At the famous Royal Victoria Infirmary in Newcastle upon Tyne it will be converting an area of the hospital into an end of life suite for family and friends to spend quality time with terminally ill patients. The other project on behalf of the Trust is at the Regent Point offices in Gosforth where the company will be fitting out a full floor in the building to accommodate staff with new work stations and purpose-made meeting space. Over the last year Northern Bear Building Services has been working closely with the client and their design team for an innovative new building project on the well-established Aycliffe Business Park in County Durham. They have now agreed a contract for work to start on the Fish Tank which will provide a swimming pool suitable for babies and their parents, and a cafe along with a meeting space, offices and function rooms. 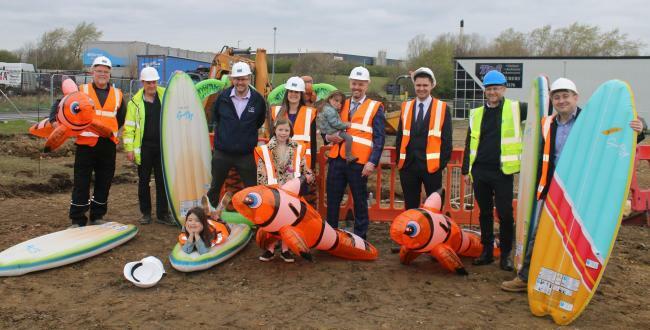 The picture below (courtesy of The Northern Echo) shows Northern Bear staff on the site of the Fish Tank together with the clients Penny and Paul Gordon and their children. Click here for the Northern Echo report.